Wow! 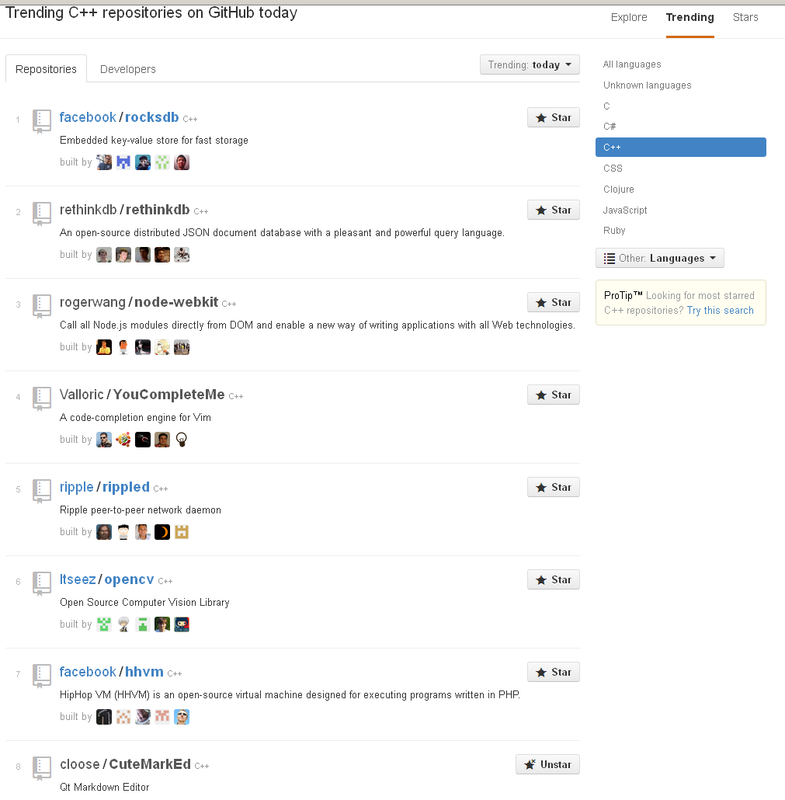 My project CuteMarkEd is on 8th place in the list of trending C++ repositories on GitHub. Thank you everybody! The CuteMarkEd will contain another great tool in the next major release. This time it’s a tool to insert an image link into the markdown document. After clicking on the okay button, a markdown image link is inserted at the current cursor position. This feature was just merged and will be available with CuteMarkEd v0.8.0. 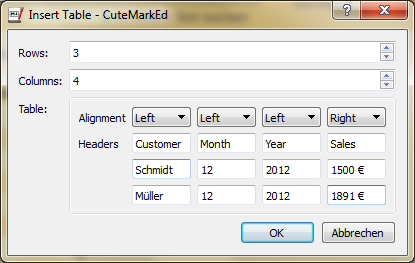 The next major release of CuteMarkEd will contain a tool to insert a table into the markdown document. 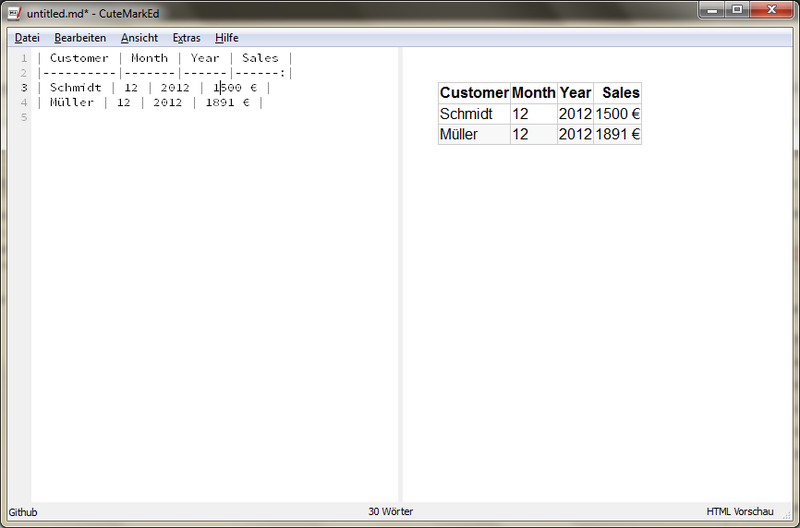 This dialog makes it easy to define the size of the table, the alignments of the columns and the content of the cells. 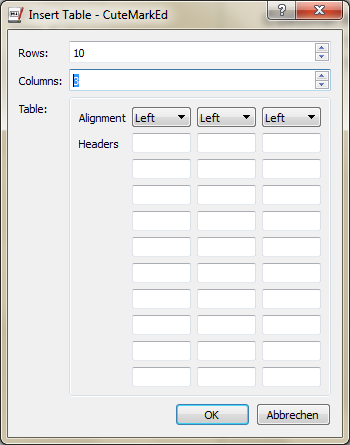 If the row or column count is changed then the table content part adapts to the change. 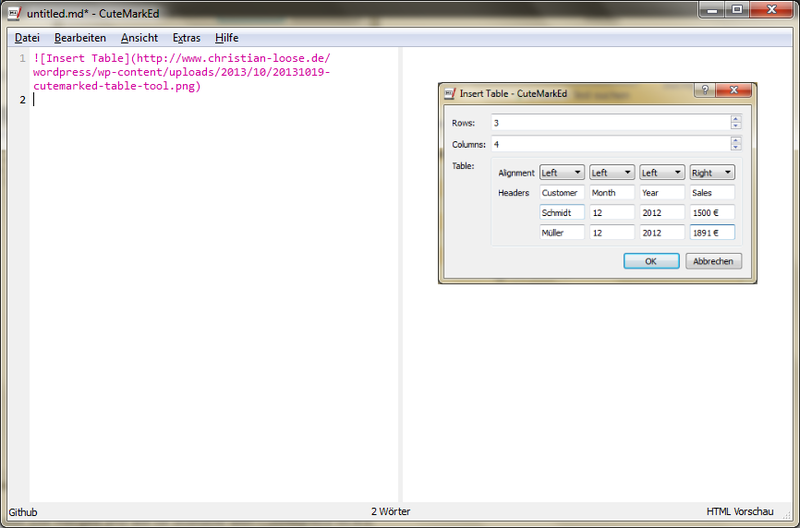 After clicking on the okay button, a markdown table is inserted at the current cursor position. Although the future belongs to newer application launchers like Kickoff, Lancelot or Raptor, some users prefer the old K Menu style. Nothing wrong with that. That’s the reason why the plasma team made it really easy to switch the menu to a more KDE 3 like style. Unfortunately this “classic menu style” was quickly made and it missed a few features. To improve the situation, I tackled the wishes #158302 and #187014. … and it also offers the same context menu as the Kickoff style. Both features will be available with KDE 4.3. Have fun! In his blog, Aaron wrote down some thoughts about how we might be able to improve our bug tracking system. As always a good read with some very valid points. But my opinion is, before we should think about any improvements, we (the maintainers) should improve our track record towards bug reports with patches. I hoped that the “reports with patches” link on bugs.kde.org would improve the situation but it didn’t. KDE has 445 open bug reports with an attached patch at the moment. Some of them as old as April 2003 and with no comment at all (examples: #57303, #83387, #58598). I know that not all patches are good or correct but IMHO this leaves a bad impression on our project. We all know that patches are often the first step to become a KDE contributor and we tell people to attach their patches to a bug report so they don’t get lost. But what’s the sense for this when those reports are then ignored for months? So lets show that we are thankful for the patches by letting the good ones into our subversion repository. I thought that some of you might be interested in the current status of the long-promised subversion support in Cervisia. Especially since the competition (kdesvn, eSvn, etc) is maturing fast. You can find the code in KDE’s subversion repository under branches/cervisia/subversion_support. 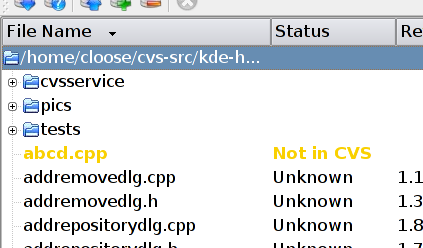 It is still in a work branch because the cvs plugin isn’t feature complete (compared to the KDE 3.5 version). Will you make the KDE 3.5 feature freeze deadline? Realistically speaking, no. As hinted above, the main problem is the cvs plugin. We will not be able to provide all features that the KDE 3.4 version of Cervisia offered to cvs users by August 25th. The KDE 3.5 release definitely comes to early for us. Does it mean I have to wait for KDE 4? I hope not. I’m thinking about a separate release of Cervisia with subversion support after KDE 3.5. But I can’t promise it because I don’t have any experiences with such releases. What subversion commands are implemented? The current version has support for add, remove, commit, status, annotate/blame and log. After we finished update and diff, the basic features for the daily work are available. Do you use the subversion library? At the moment we use a subversion DCOP service which starts the subversion command-line client. The output is later parsed by the svn plugin. We used this approach because of our experiences with cvs but there is also a discussion on Cervisia’s mailing list about kio_svn. There is a good chance that we will switch to this subversion kioslave in the near future. 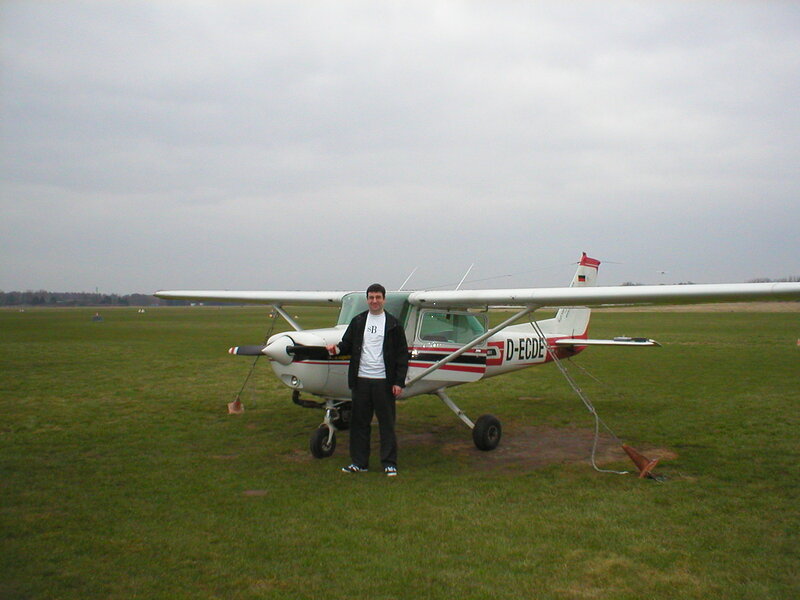 For my 30th birthday, my family gave me a gift coupon for a flight lesson (Schnupperflug) as birthday present. A few days ago, the weather was finally good enough to take the lesson. 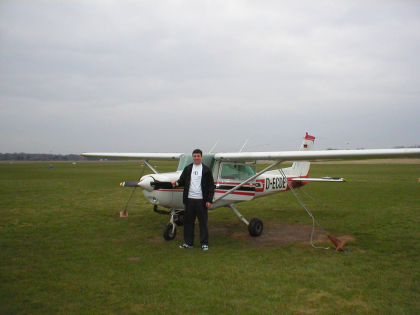 I have never flown in such a small airplane (Cessna 152) before let alone being the pilot of it. I was a little nervous at the beginning, but the instructor was very nice and calm. So after a few minutes in flight, I was confident enough to relax a little. When I got the present, I thought that I would take over the steering wheel after the start and just fly some curves, but the instructor just helped a little and the rest was up to me. So I actually also started and landed the airplane! Yes! 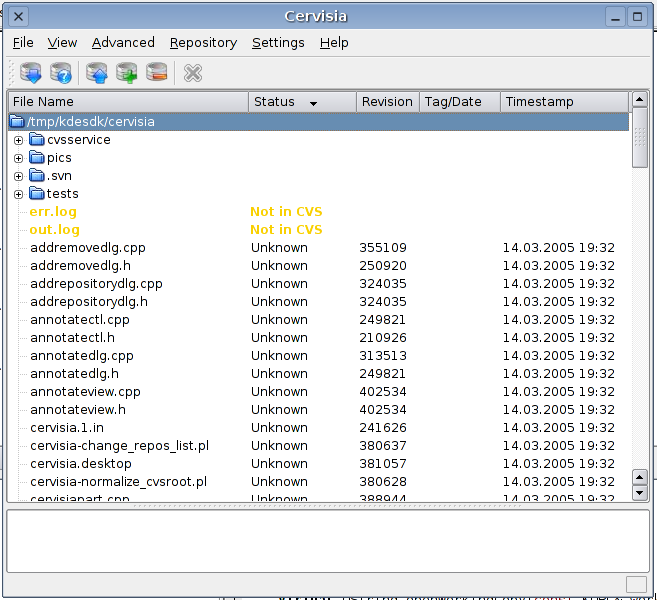 This is Cervisia showing a Subversion working copy directory. The last Cervisia feature that went into cvs before the feature freeze was the bugzilla wish #95257. With this new option in the settings dialog, you can highlight files in the file view with status “Not in CVS”. The default is the text color but you can now change it to something different. The KDE 3.4 version of Cervisia will be a pretty boring release. 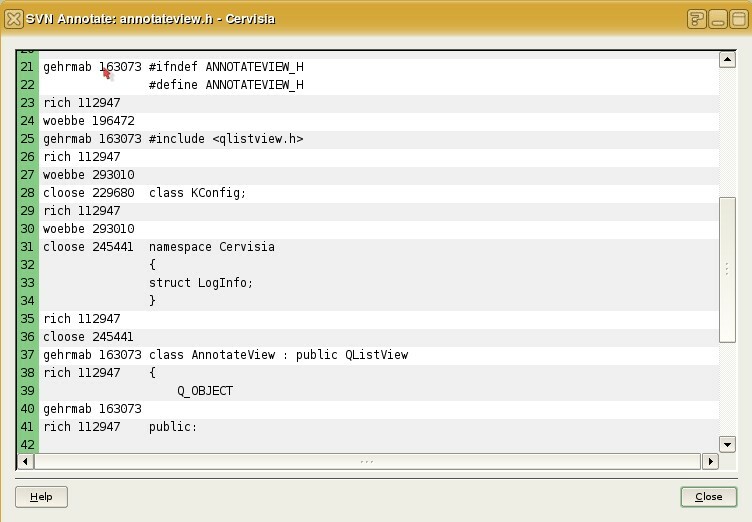 I didn’t spend much time working on Cervisia since “aKademy”. The reasons were basically: lack of motivation, work and WWII Online. But now the interest in Cervisia is coming back. A little late for KDE 3.4, but I’m sure that the next release will be more exciting again.